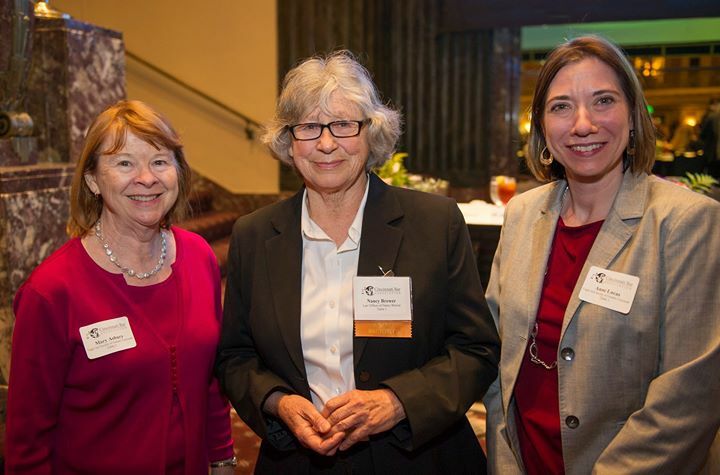 The Volunteer Lawyers Project (VLP) announced Nancy Brewer as our 2015 Volunteer Lawyer of the Year at the Cincinnati Bar Association annual meeting in April, 2016. Ms. Brewer is a solo practitioner who specializes in employment discrimination. Since her relocation to Cincinnati in 2010, she has accepted 34 case referrals in the areas of divorce, custody, consumer and unemployment compensation. In 2015 alone, Ms. Brewer accepted five case referrals and was able to achieve positive outcomes for all clients. Her successes are extraordinary, reflecting her hard work and commitment both to pro bono work and to her clients. Congratulations, Nancy! Ms. Brewer went to law school after raising 4 daughters. She attended the University of Michigan and obtained her JD from Georgetown Law Center. She joined the Michigan bar in 1993. After clerking at Wayne County Superior Court in Detroit and serving as a trial attorney at the Equal Opportunity Commission in Texas, Ms. Brewer moved back to the Midwest, joining West Virginia Legal Aid. During her seven years at Legal Aid, Ms. Brewer made three successful trips to the West Virginia Supreme Court and one to the Fourth Circuit on employment discrimination and landlord tenant issues. The West Virginia Supreme Court chose to hear one appeal in a sexual harassment case at the law school of the University of West Virginia before the student body. After serving at West Virginia Legal Aid, Ms. Brewer worked as a senior associate at several private firms in Washington DC, specializing in employment discrimination, and then at North Carolina Legal Aid where she practiced landlord/tenant and consumer law. Upon her relocation to Cincinnati in 2010, Ms. Brewer immediately signed up with the Volunteer Lawyers Project! Since then, she’s handled 34 cases for the VLP. In 2015, Ms. Brewer accepted five case referrals and was able to achieve positive outcomes for all clients. In one instance, Ms. Brewer took an unemployment case on a Thursday afternoon for a Monday morning hearing. She won the appeal and the client received unemployment compensation benefits, which had been denied to her two times by the Unemployment Commission. Other cases included a wage claim situation in which Ms. Brewer recovered 2.5 times wages owing to the client.